May 4: Moderating "Rethinking Feeding Behaviors"
"Millennials: The Trampoline Allowing Vet Visit to Bounce Back" and "Fear Free, Cat Friendly Practices: What Feline Practitioners Can Do to Engage Clients and Cats"
"Fear Free Be the Change," "Dogs are Not Wolves," "Science of Pheromones: Cats," "Good Kitty to Bad Kitty: Dealing with the Most Common Cat Behavior Problems"
9 a.m.: Keynote;11:15 a.m. "Fear Free: Be the Change"
Moderating session with Byron Blagburn, MS, PHD; Cassan Pulaski, DVM; Christopher. Rehm, Sr., DVM; . Edward Wakem, DVM. *December 9: Decoding the Fearful Dog, from the Sounding Beginning Program, Fountain View Recreation Center, 910 Gary Ave., Carol Stream, IL. $20 suggested donation, event at 7 p.m.
Plaza of the Americas, 448 N. Michigan Avenue (next door to Wrigley Building). Emcee and lead march to promote puppy mill awareness. Chicago Police Department Chaplain Bob Montelongo will bless the dogs. *June 25-26: American Association of Feline Practitioners Cat Friendly Practices at Purina (St. Louis, MO) speaking to veterinary student leaders with with Elizabeth Colleran, DVM, DABVP (feline). *June 6: Facebook live host “Heroes Know the Truth About Dog Flu: What’s Real and What’s Not,” 6 p.m. CDT (HERE is where you can view the event and it will be shared on my Facebook fan page. ). *June 5: Memorial Tribute to Dr. Donna Alexander (Cook County Building, Chicago, IL). Panel moderator for this major press event and Facebook live, a announcement will be made to change the course of protecting all victims of domestic violence . K-9 Reading Buddies of the North Shore, in partnership with the Park District of Highland Park, celebrates 10 years of service with the K9 Pup Strut & Expo which Steve kicks off, and emcees associated events, 9 a.m. to 2 p.m.
April 19: “Fear Free: Be the Change” 2:45 to 4 p.m.
April 20: “Kitten Socialization” 8:30 to 9:30 a.m.; “Cats and Dogs Living Together,” 11:15 to 12:15 and participant on Fear Free panel, 3:45 to 4:45 p.m.
“Cat Health Update from 50 Years of Winn Feline Foundation: And Fearful Cats to Fear Free,” 1 p.m.
*February 16: For the Love of Pets Benefit for Friendship Pet Food Pantry at Begyle Brewing (1800 W. Cuyler, Chicago, IL). February 5: 5:30 to 6:45 p.m. Moderating session: “Lead the Way Save More Lives: A Practical Discussion on Leadership, Innovation and New Protocols,” with Iain Prior BVSc, CVJ; Nancy Soares VMD. February 6: 6:30 to 7:30 Technician breakfast, “Communication that Leads to Real World Compliance; ” with Julie Legred, CVT. *November 25: Guest speaker fundraiser for SPCA Puerto Vallarta, Mexico. *November 3: Host for premiere screening “Aires” (Lincoln Center, 61 West 62nd Street, New York, NY). Proceeds of the screening benefit the Winn Feline Foundation. Tickets are $16. *October 25: Big Night Benefit for Chicago Animal Care and Control, from Friends of Chicago Animal Care and Control (Chicago Cultural Center, Chicago, IL). Emcee for the annual benefit featuring Chicago’s best chefs, and stars of the Chicago Fire TV show. *October 7: Chicago Canine Rescue Mutt Strut (Chicago, IL) Emcee/Strut Marshall. 11 a.m. to 3 p.m. Walks begins at corners of Newport St. and Southport Ave. in Wrigleyville at 1 p.m.
*September 18: Puppy Up, Chicago Walk (near Montrose Avenue Beach, Lincoln Park, Chicago, IL). Emcee for rally, and host of Facebook Live ‘Green Carpet’ event. Puppy Up supports funding for comparative medicine studies of cancers in dogs/cancers in people. *September 17: Puppy Mill Awareness Day March (Michigan Avenue at the Wrigley Building, Chicago, IL). Emcee for rally and march down Michigan Avenue. *September 6-7: Veterinary Congress Leon, CVDL Leon (Leon, Guanajuato, Mexico). Eights talks for the second time at the largest veterinary conference in Mexico/Latin America. Sept. 6: “Good Kitty to Bad Kitty” (common cat behavior problems, 2 parts), “Pet Meets Baby,” and “Bad Cat or Sick Cat: Is it Behavior of Medical,” with Susan Little, DVM, DABVP (feline). * September 1: Host/Emcee fundraiser for Windy Kitty Cat Cafe & Lounge (1746 W North Avenue, Chicago, IL). Benefit, which includes an auction, and lots of veggie food and drink, starts at 6:30 p.m.
*August 15: Bowling for Rhinos (Chicago, IL). Lincoln Park Chapter of the American Association of Zoo Keepers fundraiser to support rhinoceros conservation. Appearance at the event. *August 13: Canine Cruise for Friends of Chicago Animal Care & Control (Chicago, IL). I am the honorary captain for this dog-friendly ride up the Chicago River and out to Lake Michigan, benfiting Friends of Chicago Animal Care & Control. August 3: Presentations: “Pet Meets Baby,” “Dogs Weren’t Bred To Be Couch Potatoes: Why We Must Enrich Our Dogs’ Lives (canine enrichment), “Brain Dead Fat Cats” (feline enrichment), “Good Kitty to Bad Kitty” (common cat behavior problems), “Real World Pet Behavior” (case studies: pet behavior). *July 31: Ovarian Cancer Symptom Awareness Annual Dinner (Boulder Ridge Country Club) Lake in the Hills, IL. Introduce guest speaker researcher Cynthia Otto, DVM, PhD Penn Vet Working Dog Center, working with dogs to create an early screening test for ovarian cancer. *July 21-25: AVMA (American Veterinary Medical Association) Convention, Indianapolis, IN. July 21: 11 a.m.: Introducing Fix by Five initiative on pediatric spay/neuter of cats. July 24: 7 a.m. Moderator “Lead the Way Save More Lives: A Practical Discussion on Leadership, Innovation and New Protocols,” with Iain Prior BVSc, CVJ, Nancy Soares VMD. *July 20: 2017 Veterinary Behavior Symposium, Indianapolis, IN, at JW Marriott. Attendee. *June 29: Winn Feline Foundation Symposium, Fairmont Hotel (200 N. Columbus Dr.), Chicago, IL. Moderator: “Ending FIP: Is there Hope?” Niels Pedersen, DVM, PhD Distinguished Professor Emeritus University of California-Davis, 4 to 6:30 p.m. Also, celebration of 50 years of the Winn Feline Foundation. *June 28: Mondog (Montrose) Dog Beach, Chicago, IL. offering free swag and free behavior advice in conjunction with the Good Stuff Pet Truck , 5 to 7 p.m. for Vita Bone Trainers and Supreme Source pet foods. *June 27, 28: Winn Feline Foundation Board Meeting and strategic planning, Chicago, IL. Fairmont Hotel (200 N.Columbus Dr.). Steve serves on Board of Directors, Winn Feline Foundation. *June 24 puppyup Companions Again Cancer Foundation, Chicago, IL: One of several speakers about how cancer is the same in dogs and people. So by studying dogs and coming up with solutions, we may be helping people – comparative medicine is a good idea. Noon at Lou Malnati’s Pizzeria, 1120 N. State Street. Public is invited. * June 23 Take Your Dog to Work Day Facebook Live, from the Nerdery, Chicago, IL Interviewing employees, and even their dogs, as well as an expert from the Human-Animal Bond Research Initiative (HABRI), and revealing new data on pets in the workplace from Purina. *May 21: Bark in the Park, Chicago, IL benefiting Anti Cruelty Society, co-emcee for what is billed as “Chicago’s largest dog party,” as thousands of dogs (and people) participate at the Green adjacent to Solider Field, including – for those who like – a scenic 5K walk along the Chicagolakefront, starting at 8 a.m.
May 19: Cat Friendly Practices, American Association of Feline Practitioners “No Pain No Gain Revealing the Secret Sauce: How a Positive Feline Veterinary Experience Will Matter” (2 parts) and “Communications Boot Camp, The Feline Enigma” also with Elizabeth Colleran, DVM, DABVP. *May 18: Cat Writers’ Association/BlogPaws, Sheraton at Myrtle Beach Convention Center Hotel in Myrtle Beach, SC. Moderator: American Association of Feline Practitioners (AAFP) panel – “Cat Friendly Practices Begin at Home: How Your Help is Needed to Save Cat Lives” with Ken Lambrecht, DVM and his cat, Bug. *May 13: Puppy Mill Project Mother in the Mills Benefit, Chicago, IL: Steve attends this benefit, as he doe annually. Because of organizations like the Puppy Mill Project,something is being done to support awareness of puppy mills, which sadly continue to thrive. .The event is at Moonlight Studios (1446 W. Kinzie Street), 7 p.m. The band Out of Control performs. Paul Lisnek of WGN-TV and CLTV is the emcee. Another way to help A support the Puppy Mill Project is to purchase a coffee table book featuring Chicago celebrities and their pets.The Chicago Pet Project is a ginormous book filled with images of notable Chicagoans and their beloved pets taken by photographer Karen Morgan, which I am honored to be included in. * May 4-6: 2017 Nestlé Purina Companion Animal Nutrition (CAN) Summit, Vancouver, British Columbia, CA. Attendee. *March 30-April 2: American Animal Hospital Association Conference, Nashville, TN. *March 22: ASA (American Society on Aging) Conference, Chicago, IL Moderator “Better Together:Health Aging for Pets and People.” Panel includes Zara Boland, BVSc, BE, MRCVS; Steven Hannah, PhD; Matt Kaeberlein, PhD, Gerardo Pérez-Camorgo, PhD, DVM. Panelist with Pilley Bianchi of Chaser “The World’s Smartest Dog,” Loni Edwards of the Dog Agency and Herbie Calves of Link AKC. * March 12; Fear Free Symposia, Dallas, TX Steve’s talk is “Why the Public Is Demanding the Veterinary Profession Look After the Emotional Wellbeing of Pets,” as a contributor to day long symposia with Marty Becker, DVM; Jonathon Bloom, DVM; Debbie Martin, RVT, CPDT-KA, KPA CTP, VTS (Behavior); Lis Radosta, DVM, DACVB. *March 9-10: Winn Feline Foundation Board Meeting, Winn Feline Foundation Grant Review Meeting, Las Vegas, NV. *March 5-8: Western Veterinary Conference, Las Vegas, NV. Attendee. *March 1: North Carolina Academy of Small Animal Medicine, Sanford, NC. Fear Free presentation, and moderator for presentations and lowering pet anxiety and Double Defense heartworm protection with Byron Blagburn, PhD; Valarie Tynes, DVM, DACVB, Robert Wirtz, PhD. *February 9: Recipient, Nobivac Pet Journalist of the Year Award, presented to Steve at New York Pet Fashion Show, New York. NY. 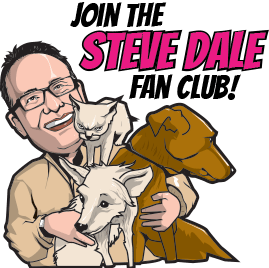 https://www.stevedalepetworld.com/steve-dale-wins-journalist-year-dog-flu-coverage/ . *February 3-7: North American Veterinary Conference, Orlando, FL. Attendee. *December 1-2: Colonial Veterinary Conference, Williamsburg, VA.
Steve talks about bringing home babies to pets (preparation to avoid issues and what to do if there are issues), kitten socialization classes, environmental enrichment for dogs and cats and various cat behavior topics. One big time passion, and program is with Theresa DePorter, DVM ECAWBM, DACVB as together they explain how to get Pets to Vets. *November26: Guest speaker fundraiser for SPCA Puerto Vallarta, Mexico. * November 4: Centers For Human-Animal Bond Conference, Purdue University, West Lafayette, IN. Attendee. * November 2: North Carolina Academy of Small Animal Medicine, Sanford, NC Moderator for day-long continuing education on Double Defense heartworm protection, and parasite control in cats, with Michael Lappin, DVM, PhD, DACVIM; Bryon Bagburn, PhD, John McCall, PhD. *August 5-9: Convention of the American Veterinary Medical Association, San Antonio, TX. Attendee. *June 25: Blogpaws, Sheraton Wild Horse Pass Resort, Phoenix, AZ. “The Secrets to Successful SEO: What to Say and How to Say It?” with Bill Schroeder, inTouch Practice Communications. *June 4: LaGrange Pet Parade: America’s Original Pet Parade. One of Steve’s dogs, Hazel, makes an appearance too! LaGrange, IL. The route can be seen here. Previously, Steve’s previously been a Grand Marshall or co-Grand Marshall five times. Of course, watching the parade – which includes hundreds of pets (mostly dogs, but an occasional cat in a carrier even hamster in a cage) – is free. *April 30: 11th Annual Applied Animal Behavior Conference, University of Wisconsin College of Veterinary Medicine, Madison, WI (at the Alliant Energy Center). 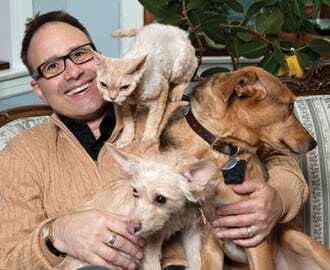 Steve presents 9 a.m. to noon, on enriching lives of dogs, enriching lives of cats and the new Fear Free initiative (how to lower stress in veterinary clinics, and why that matters to animals and their people. Steve believes many animals actually think they are literally going to die at veterinary offices – he explains). http://www.vetmed.wisc.edu/continuingedu/brochures/Behavior.pdf. *March 30-April 2: American Animal Hospital Association Conference in Austin, TX. Attendee. *March 10-11: Winn Feline Foundation Board Meeting and Grant Review Meeting, Las Vegas, NV. Steve is on the Board of Directors of the Winn Feline Foundation. *March 3: Steve is host at the premiere of the movie “The Champions,” the story of the Michael Vick Fighting Dogs, AMC River East 21 (322 E. Illinois St., Chicago, IL), at 7 p.m. This documentary is the story of the dogs rescued from Vick’s dog fighting ring. While there was a cry to euthanize all the dogs, Best Friends Animal Society outrightly rejected that idea. It’s a story of redemption, hope and overcoming prejudice. Steve will offer some words following the screening, and host a Q & A session with several representatives of Best Friends. Learn more: https://tugg.com/events/89974# and reserve tickets. *March 1-2: Steve participates in a Pet Partners round-table discussion, Bellevue, WA with various experts to to discuss the creation of a set of evaluation exercises designed for Pet Partner teams working with children in animal assisted therapy or animal assisted activity sessions. Steve serves the Pet Partners Human-Animal Bond Scientific Advisory Board. Learn more: https://petpartners.org/. *February 26-27: Midwest Veterinary Conference (Greater Columbus Convention Center, 400 N High St, Columbus). Steve speaks with veterinary Theresa DePorter, DVM, DACVB, ECAWBM about “Getting Pets to Vets” and he also talks about “Brain Dead Fat Cats” (enriching cats’ lives) and “Unemployed Dogs” (enriching dogs’ lives). Steve also speaks about marketing and how to use social and traditional media. http://www.mvcinfo.org/downloads/attendees/2016MVC-RegistrationProgram.pdf. *January 17-19: North American Veterinary Conference, Orlando, FL. January 18, Steve participates in a session about the dog flu, Chicago: Lessons Learned,” with Melissa Bourgois, , DVM, PhD, DACVIM and Natalie Marks, DVM, at 11 a.m..
*January 16: Fix by Five: Steve serves on a National Task Force meting, Orlando, FL to create a recommendation to set a standard for when to spay/neuter kittens. http://www.mariansdream.org/animal_welfare/the-cats-can/fix-by-five/beat-heat/. November 28: Guest speaker fundraiser for SPCA Puerto Vallarta, Mexico.